Plumbers have come to rely on plumbing cameras as one of their most valuable tools. These specially constructed, waterproof cameras allow for the easy investigation and diagnosis of plumbing-related problems. For underground pipes, including the sewer line, these cameras have revolutionized the plumbing business. Instead of lengthy excavations that could destroy a yard, plumbers need simply deposit a plumbing camera into the sewer cleanout pipe. At Metroplex Leak and Line Locators, we understand all the uses of plumbing cameras, and employ them in the best possible fashion. If a pipe rests under cement, or passes beneath your neighbor’s yard, we can still access it to treat your issues. If you need an inspection with a plumbing camera in Mesquite, TX or the Dallas area, look no further than Metroplex Leak and Line Locators. Call us today at 214-388-4525 to schedule service. The main benefit of a plumbing camera comes from a lack of guesswork. In addition to what the camera views in the pipe, radio transmitters broadcast the depth and location of any blockage. In the cases where digging is still necessary, this allows us to quickly and accurately locate and fix the problem. A plumbing camera can identify all varieties of problems. The camera will reveal whether the blockage or clog necessitates more invasive treatments, or whether a misalignment or corroded area has emptied sewage into your yard. We recommend that a homeowner employs our plumbing camera service in the event of repeated clogs or blockages in the line. We can also perform these camera inspections prior to the purchase of a home, to determine the condition of the sewer and other plumbing lines. 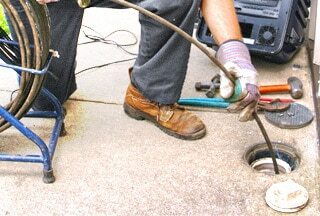 A plumbing camera consists of a flexible rod with a high-quality, waterproof camera on its tip. The camera can fit into the tightest of plumbing spaces, and also turn corners, while providing high-resolution photos to the plumber. If you want an inspection with a plumbing camera in Mesquite, TX, or the Dallas area, call Metroplex Leak and Line Locators today at 214-388-4525. We’ll get to the bottom of your plumbing issue, then turn around and offer you a fast, expert repair.